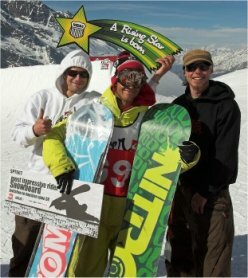 Last weekend, the best snowboard rookies from Austria, Germany and Switzerland met during the Finale Grande of the Snowpark Tour 007 in Saas-Fee, Switzerland. Patrik Huber (AUT) was crowned the “most impressive rider” andAnais Cettou (SUI) took the girls’ victory. The shapers set up a kicker line with two kickers and a quarterpipe. At the in-run, riders could choose between two rails. The additional box line offered four different slide boxes. The 70 riders were also delighted by the nice weather and the fact that the participation in the event and accommodation were free. With nice 360s and smooth box slides, Anais Cettou (SUI) took victory. Elena Könz (SUI) got second and Helen Wyss (SUI) third. The snowboarders showed their skills riding in four-man teams that represented their respective snow park. The teams from Lech, Flachauwinkl, Flumserberg and Saas-Fee reached the super finals. In the end, the Lech team was the one to cheer. Patrik Huber, Wolfgang Wanner, Tommi Gimpl and Michael Macho showed faultless runs. 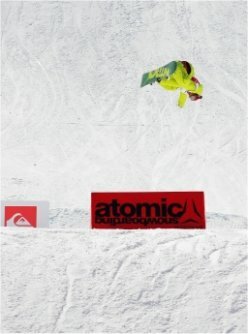 The creative team from Flumserberg took second with a rapid fire show at the boxes while the Saas-Fee riders got third. The three teams were invited to the TTR Bootcamp at Innsbruck. At the single decision, Patrik Huber (AUT) took the title of the “most impressive rider”. He got a wildcard for the Nanshan Open in China.Kobi Würsch (SUI) was second in front of Lukas Perteneder (AUT).